The Riksbank’s September meeting was a pivotal one, with policymakers providing firm guidance that they intend to hike rates in either December or February. Having committed so clearly to a hike, it is unlikely that they will back down now. The October meeting is likely to prove less interesting, with policymakers reiterating their previous stance. There has been a couple of key data points since the September meeting. For the Riksbank, the most important news is likely the rebound in core inflation. A weak August figure was offset by a strong reading in September, which showed underlying inflation in line with the Riksbank’s forecast. And the latest inflation expectation surveys also indicate a consolidation of expectations around the 2% target. 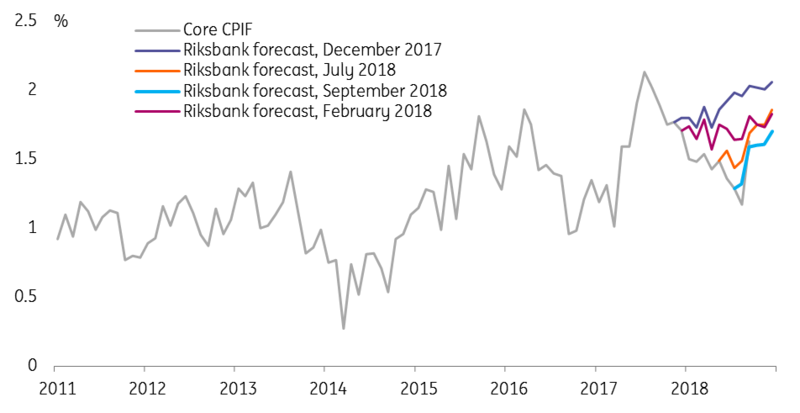 Given that seven out of the previous eight months had seen core inflation below the RIksbank’s forecast, this will be a relief to policymakers. And even better, service inflation jumped to 1.9% -- weak service sector inflation has long been a key plank in the dovish argument for keeping rates unchanged. The KIX trade-weighted index has appreciated a bit faster than the Riksbank’s forecast (currently about 1% stronger than the Riksbank’s forecast for 4Q). But given the currency has depreciated significantly in 2018 and Governor Ingves’ often repeated view that it is difficult to forecast exchange rates, we don’t think this will be too much of a worry. But the good news on inflation must at least partly be offset by signs that the Swedish economy is slowing down. 2Q18 GDP was revised down materially (by a total of 0.8% including changes to previous quarters) after the Riksbank’s last meeting. And the latest data on the housing market also suggests that troubles there are not yet over – prices fell in September, and supply remains at record highs even as fewer housing units are being sold. New construction is set to slow materially, and there are signs that the housing market troubles are negatively affecting household consumption. In our view, the risks to the domestic Swedish economy are skewed firmly to the downside. 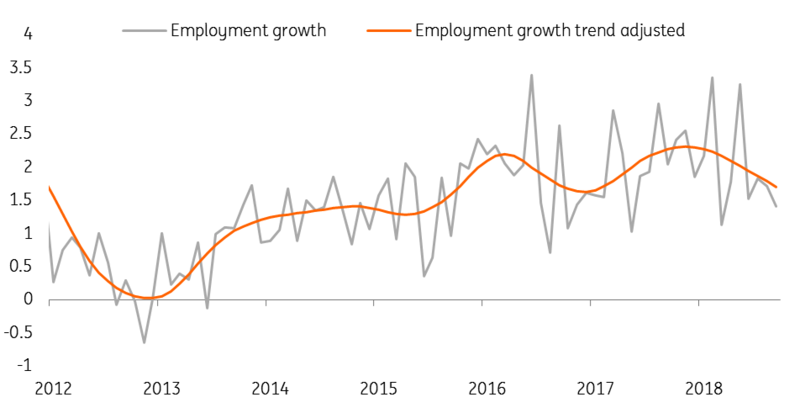 The labour market data also suggests the Riksbank’s forecast for the economy is a bit on the rosy side. Unemployment over the past couple of months has come in a bit above expectations as employment growth has slowed. And wage growth, currently at 2.6%, has (yet again) disappointed and looks unlikely to reach the 3% the Riksbank is hoping to see by year-end. This suggests that the outlook for inflation remains poor; much of the current strength in inflation current boost from high energy prices and krona depreciation, which will start to wear off next year. In addition, the global risk environment will continue to worry policymakers, not least Governor Ingves who will just recently have returned from what seemed like a pretty gloomy IMF annual meeting. From stock market volatility, Italian budget arguments, US-China trade tensions to the ongoing woes among emerging markets, there is no shortage of issues to worry about (though of course the same could be said back in September). And of course, Sweden is itself going through an unusual period of political uncertainty, with no new government formed since the September 9th elections -- the longest post-election stalemate since at least the pre-war era. On balance, we think the positive news on inflation probably outweighs the marginal bad news on other issues for Riksbank policymakers. This means they will likely stick closely to the language agreed in September, keeping its options open. Two MPC members (previous dissenter Deputy Governor Ohlsson and Deputy Governor Floden) are likely to vote for a hike at the October meeting, taking the vote count for the current stance to 4-2. Given that an unchanged stance brings the rate hike one step closer, this could easily be seen a marginally hawkish meeting – especially if there are any hints that policymakers are leaning towards a December hike.